The Church Council of Greater Seattle decries the announcement of efforts by the new presidential administration to extend a “border wall,” ramp up enforcement, curtail applications for asylum and halt the granting of refugee status. These actions will lead to greater separation of families and loved ones, divide communities, sow hate and place people fleeing rampant violence and persecution at risk of immense suffering and death. Such measures, coupled with the regime of raids, detention and deportation, further the dehumanization, violence and racism that migrating populations face. Immigrants and refugees seeking to rebuild their lives, including many families with children, pose no “threat” to our country. 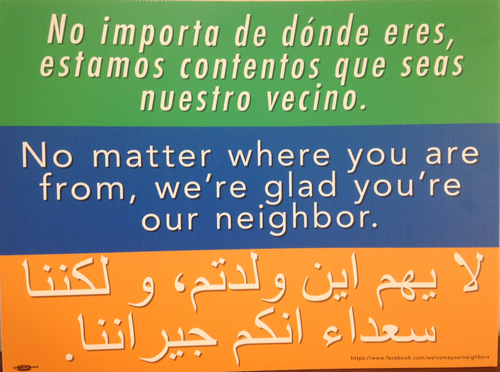 Faith communities pledge to welcome them as our neighbors and as full, contributing members of our community life. Our acting as neighbor with and offering solidarity to Muslims and all religious groups are an exercise of religious faith. While sanctuary ordinances and practices are consistent with the law as provided by the Constitution, we also uphold and affirm a higher, spiritual law, which says that the civil rights and human dignity of all God’s people must be honored. We pledge circles of protection that say you are welcome. Our houses of worship require no documents and are open to all!